"Made of crazy long haired faux fur in yellows, red and orange, this adorable character has plush hands and feet, with 'Sun' embroidered onto the bottom of his left foot. With 2 beady eyes and a little mouth peeping from behind his fiery exterior, these educational toys make learning fun!" Sun is located at the center of the Solar System. No wonder he has an ego. Who can blame him? The World literally revolves around him! I’m a real hottie! The temperature at my center is a sizzling 15,000,000 Kelvin and on my surface 6,000 Kelvin. I am the star located at the center of your Solar System and I am one among an estimated 200-400 billion stars orbiting in the Milky Way Galaxy. 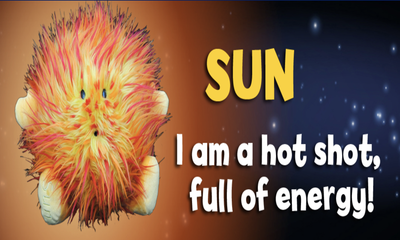 I am composed of mostly hydrogen and helium with trace amounts of other elements. All my energy is produced in my core by nuclear fusion. This energy travels to the surface and is emitted as visible light reaching the Earth in 8 minutes.